Dwarka Expressway, categorised as a National Highway in the year 2016, was launched as an ambitious project to provide an alternate connectivity between Delhi and Gurgaon. The road that was to link the National Highway 8 in Delhi to Kherki Daula toll at Gurgaon, 18 km, in all was supposed to completed by 2010. After several legal hassles and construction delays things have started to look up for the road project. Close to 100 residential and commercial projects are planned along this massive infrastructure initiative. The project range in residential segment range from affordable housing to premium and luxury villas. Some of the popular developers here are – Sobha, Godrej, Adani, TATA, ATS, Conscient. Apartment prices in the regular residential segment range from Rs. 55 lks for 2BHK to Rs. 8-9 Cr for palatial villas. We have elaborate notes on popular projects on Dwarka Expressway such as – Sobha City, Sobha International City, ATS Triumph, ILD Greens, Experion Windchants. Much has been said about this impressively planned road of 18 kilometer that would become alternate connectivity to New Delhi from the millennial city of Gurgaon. South Delhi is a prime address however it is now congested and out of reach of many. While Gurgaon has seen haphazard development in many of its central business districts, again much of residences there are in the premium and luxury category. On the other hand National Highway 8 which is the most used route to Delhi has seen its own share of controversies for traffic jams and road mishaps. Thus several years back in preparation to the Commonwealth Games, Dwarka Expressway was planned and supposed to be operational by 2010. It is 2016 and there is no road, forget the road there is no basic infrastructure to support quality habitation. There is hope, there is hope which has never been this well appreciated for years. We have written about the developments along the Dwarka Expressway time and again, but everytime we wrote we were criticized. Before I start my commentary this time around I wish to make it clear we love infrastructure development, because it helps fostering urban development in a balanced way. We aren’t critical of the real estate industry as much as we are of the authorities who own the responsibility of providing infrastructure. For those who haven’t followed this geography of Gurgaon the Dwarka Expressway will connect National Highway ahead of Kherki Daula toll to Dwarka in Delhi and merge into the highway again, near the Indira Gandhi International Airport of Delhi. Along the road aspirational projects such as Metro line, several sector roads and housing was planned. When fully developed this entire stretch will be a more planned and phased development than rest of Gurgaon. But the prime question is “When”. More than 100 projects (mainly Group Housing) are expected to deliver anywhere from 50,000-60,000 homes along the sectors on this road. Thanks to Dwarka Expressway the number of sectors at Gurgaon is comfortably above 100, though reaching them even on Google maps might be a tiresome exercise. Several large institutional developers such as Sobha, TATA Housing, Mahindra Lifespaces, Godrej, Adani among others are present here. While the regional players include Puri, ATS, Bestech, Experion and many more. And this list can go on, with several developers having completely shelved the projects leaving buyers in a limbo. So much so that recently the state’s Chief Minister – Mr. Khattar held a meeting with Real Estate Developers at Gurgaon to take stock of the situation. While connivance of certain real estate firms isn’t ruled out but much of the apathy that buyers of real estate suffer is because of the delay in execution of this 18 kilometer, 150 meter wide road. Several young and old buyers or investors bought a piece of real estate here assuming the market was offering value in respect to other part of the cities of Gurgaon and New Delhi. However they continue to suffer as the prices in the area soared till about 2012/13 when these houses and apartments here were trending probably much higher to their intrinsic values. There has been no movement in prices since then in fact many people are probably witnessing losses in their real estate investments in a short span of time. Real estate markets across the country are sluggish, but a visit to Gurgaon will suggest to you that the market here is nearly stalled. However, this also gives rooms to several real estate developers with better balance sheets and prudent teams to rise at this moment and acquire projects in distress to expand their footprint. This is being witnessed in patches here. Also certain institutions such as Sobha Ltd., Mahindra and TATA have kept a good pace with their developments and delivering housing units as per agreements. Another property though not right on the Dwarka Expressway, Bestech Parkview Ananda was delivered as per the timelines, and developer’s Parkview Grand Spa too is coming up for delivery this year. (we may have missed out mentioning other developers but this is as per the limited data gathered during the recent recce). Other projects which are at advanced stages are Puri Diplomatic Greens, Experion Windchants and certain properties of Orris and Godrej. But the big question even today is if the property were to be delivered today how does one move in for a comfortable life till other issues are sorted out? In my earlier notes I have mentioned that to me Dwarka Expressway’s 18 kilometers is primarily divided into 4 sections; Delhi to Gurgaon Sector 111 (near Bajghera Road), Sector 111 to Sector 109, Sector 109 to Sector 99, Sector 88 to National Highway 8. Three of the above are in Gurgaon. While I see heightened activity on the Railway Over Bridge between Sector 99 and Sector 88 at Gurgaon and several other development plan roads, the land issues are being sorted out at Delhi end and between Sector 111 to Sector 109 and near the highway. With Dwarka Expressway getting notified as a National Highway recently (Minister Nitin Gadkari making the announcement) it looks like the road will get operational by the next year. Gradually we see development of allied infrastructure as well. Certain developers have launched or are launching serviced apartments, retail and office spaces too, there is severe dearth of these right now. However, the murmurs that one hears (not validated) that several sector road development may take time which is longer than expected. Another developer, Satya recently started giving handover of its project Satya Hermitage at Sector 103. TATA Housing’s recent launch La Vida at Sector 113 has raised several eye brows in Gurgaon real estate fraternity. One because it feels that someone has to be really courageous to announce a new launch at Gurgaon and second it is probably the first time in TATA’s history that a project is being launched with an easy finance scheme (possession linked plan). The plans of La Vida suggest that the developer has adjusted for market reality and planned smaller units, primarily 2BHK, 2.5BHK and 3BHK. On the other hand Sobha has launched its first apartment project in North India by the name Sobha City at Sector 108. The project by Sobha screams of luxury living by the park. Apart from these launches we have been seeing heightened activity of construction and frenzy of offers by developers trying to clear the inventory. Other development that entire real estate industry is rising up to is the introduction of RERA Act (Real Estate Regulation and Development Act, 2016). Developers need to deliver the homes before introduction of the Act for these properties to not fall under the compliance window of the Act, this is a tough ask for many projects here. Because upon introduction of RERA Act developers whose projects are delayed or are in violation of the contract, will face the heat of regulation immediately. Lastly, coming to my inspiration behind writing an update on the Dwarka Expressway yet again. Since I was at the TATA La Vida property I decided to drive along the semi-finished road next to the Sector 111 at Gurgaon. Now this road will eventually link to Delhi…Eventually! One can easily fly a small plane as the road offers a great surface to drive (like a runway). But it ends abruptly ahead of a swamp with a signboard reading – DELHI AHEAD. Thereby I had to turn back and couldn’t reach Delhi that day. Say the phrase “Do you own a property on Dwarka Expressway” in Gurgaon and you will attract unwanted stares. An ambitious road project of 18 kilometer between Gurgaon in Haryana and Dwarka in Delhi was to be operational by 2010. Its 2016 and the road is probably an year from completion. Ancillary infrastructure work may still take a little more time than an year. However, we have been witnessing the developments here for last three years and looking at the work along Dwarka Expressway today one can feel that road might just get functional by end of the current year. Estimates are that nearly 60,000 flats or plots or villas are under construction along the Dwarka Expressway in Gurgaon which was supposed to be an alternate connectivity to Delhi. Currently one can reach Delhi by MG Road or National Highway 8. The third alternative in form of connectivity to Dwarka will ease traffic movement and create a large residential and office market along side it. When fully ready there will also be metro rail connectivity to NH8 along this stretch of road. Firms such as Sobha, TATA Housing, Puri Constructions, Godrej, Raheja Developers, Bestech, Vatika are noteworthy names in the area. Adani Aangan and Suncity Avenue 102 are affordable homes launched under the HUDA’s new scheme in this region. Further there are offices, malls and service apartments under construction along this route. Satya Group is coming up with The Hive in mixed use format and Conscient is developing Conscient One which will have retail, offices and serviced apartments too. All in all it looks like while the road project is delayed which further led to slowdown in property markets in the Dwarka Expressway region, there might just be some silver lining to it in coming year. Construction of this over bridge of 1.2 kilometer is in full swing. By the looks of it as you can see in the images one can assess that majority of the work here is over and the site is well mobilised. For a long period of time connectivity across the railway line from Gurgaon to Rewari was held up which was the key bottleneck. People who know this area will understand that the road from Sector 84 to 37D is nearly seamless to drive on and it passes along projects such as – Ashiana Center Court, Godrej Oasis, Ramprastha Edge Towers and Vatika Express City. Further the road is again good to drive from Sector 100 to 109. When we say good to drive we do not mean that it is complete but desirable is a better word. 2. Haryana Government Resolving the land dispute – Much of the Dwarka Expressway construction was held up for the right of way issues. In 2015 the Punjab and Haryana High Court cleared cases of disputes on 3.5 kilometer of land where the owners weren’t agreeing to vacate the land. The Chief Minister of the state Mr. Khattar too has made several statements in the recent past showing his commitment to the infrastructure development in the millennium city which has witness widespread expansion. 3. Declaration as a National Highway – Minister for Road Transport and Highways of India Mr. Nitin Gadkari announced reclassification of Dwarka Expressway as a National Highway. This development is of high significance as all issues that have been delaying the road construction will now be resolved quickly and will receive support from Central Government. Moreover a road which is a National Highway receives significant funds on a regular basis for upkeep and maintenance. This announcement will propel the state government to fasten development of arterial roads which connect to several real estate projects. 4. Completion of Residential Projects – While many projects are running behind schedule projects such as Sobha International City, Raheja Atharva, Mahindra Aura, Vatika INXT City amongst others are nearing completion or have already been handed over. In the last two years the area also witnessed launch of affordable housing projects along Dwarka Expressway which otherwise is said to cater to luxury and premium housing (estimates say 35% of inventory in the area is of that kinds). With people gradually moving in the authorities will be under pressure to complete civil works to create habitable environment in this area otherwise they may face a severe backlash from residents and investors. As is the case with many infrastructure projects across India, Dwarka Expressway witnessed similar delays. Though one can say this wasn’t a massive project it did lead to several thousands of crores being pumped into Gurgaon property along the stretch of road. I attended a press conference by Gurgaon builders recently. That particular meeting was to launch a joint campaign for their projects in Sohna (South Gurgaon) however the journalists were more inquisitive about developments in the Dwarka Expressway market. The reason was obvious, several thousands of crores of investment took place in this upcoming stretch between Gurgaon and Delhi but the area is beyond habitation even now. I must appreciate the response by the industry which showed up a brave face and highlighted their helplessness in the face of reality – “the government failed to deliver on execution of the much hyped alternate connectivity between Gurgaon and Dwarka (Delhi)”. Things seem to be looking better now as Mr. Khattar the current Chief Minister of Haryana made a recent announcement that both Northern Peripheral Road (NPR) and Southern Peripheral Road (SPR) will be developed at a quick pace to decongest Gurgaon. 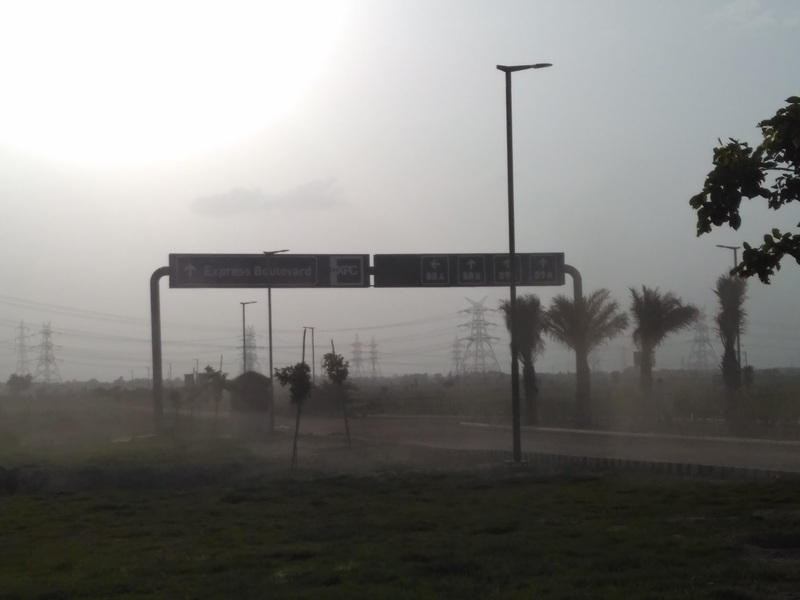 We have written about Dwarka Expressway a few times, this time I visited the zone in the middle i.e. Sector 99 through Sector 102 to Sector 109. This is probably the longest patch of Dwarka Expressway which is sort of constructed. All around the 6 lane road one can see apartment projects, villages, water bodies and “birds”. I am very surprised that Basai Wetlands right next to a large project by ATS called the Triumph isn’t declared a protected area. Basai Wetlands serves as a delight for bird watchers which include me. I hope no further construction is allowed in this region apart from projects already under development. One goes along the Basai Road and Dhankot Road to reach the sector 109 beyond which the land acquisition disputes have continued till recently. Projects such as Heritage Max by Conscient (Sector 102), Triumph by ATS (Sector 104), Hermitage by Satya (Sector 103), International City by Sobha (Sector 109), Emerald Bay by Puri (Sector 104) and Indiabulls One09 (Sector 109) flank this stretch of Northern Peripheral Road. There are vast tracts of land on either side of the road and never does one get past the tall apartment complexes which are under development. At times you may feel that there is too much construction in the works at others you may feel Gurgaon is finally witnessing some planned development. The real potential of Dwarka Expressway will be exploited only when the planned infrastructure is in place, to start with, a fully constructed road from Gurgaon to Delhi followed by all supplies (water, power etc) and sanitation (sewage, disposal) in place. The other thing one notices is that the area is witnessing excessive construction in the residential space but the commercial developments are way behind. Satya launched Element One a retail and commercial hub and Indiabulls’ One09 is in works as well. Though for such a mega urban area to develop and operate it requires far larger commercial properties followed by hospitals, schools and other. This is where the whole Dwarka Expressway story looks weak as the utilities and services lag behind in development. If one works in Cybercity in Gurgaon, for him to travel from various points on Dwarka Expressway to his office at Cybercity can take anywhere from 45 minutes to 1 hour depending on time of the day. To access this zone one needs to go through Palam Vihar on one end or sector 10 A through Basai Road on the other end. There are few other roads emanating from within the old city that leads one to this zone through village roads and otherwise. Other projects which one notices on this stretch of the road are Caladium, Paras Dew, Estella by Ansal Housing, Golf Avenue by CHD and Atharva by Raheja. Sobha Developers is about to launch its first apartment project in north India close to its International City township in Sector 109. The entire stretch of Dwarka Expressway witnessed investments during the boom periods of realty sector in India on the back of the expectations that a splendid piece of infrastructure to be also supported by a metro rail network will turn into most vouched for location in Gurgaon. However with constant delays in infrastructure delivery, issues with regards to misuse of funds collected by authorities (EDC/IDC) and excessive supply in the market have put severe pressure on the real estate development in the area. Let me be very clear I am not against the property sector or the builders or the consumers. The current bunch of fact finding missions are more to settle my own curiosity than anyone else’s. As an investor I have seen number of Information Memorandums and Deal Decks from projects across the country and many such properties were found to be planned on hopes. Hope, my dear friends is a big motivator – Obama and Modi won their elections on hope, America invaded Afghanistan hoping to eliminate terror, SEZs were announced in India on the hope that they will churn out the next big export story, FAB city was planned in Hyderabad with the hope that the city will become home to Intel and AMD and Dwarka Expressway was announced in the hope that there will be an alternate and fast connectivity to Delhi from Gurgaon. We have talked about this much awaited infrastructure project several times. In the interest of first time readers – this 8 lane, 18 km road was planned in the year 2007 to link Indira Gandhi International Airport to NH8 post the highway toll at Gurgaon. The completion was expected by the year 2010 i.e. coinciding with the Commonwealth Games in Delhi. However, we are in the year 2015 and there are no signs that the road will be operational anytime soon. To me Dwarka Expressway is divided into 3 zones. The first one is between NH8 and Sector 37D/ Vatika Express City, the second one is post the currently under development Railway Over Bridge at Sector 100 to Sector 104/ 105 and the third is there onwards to Dwarka. While we covered the first one in our earlier blog, I was more inclined to travel to areas closer to Dwarka and the Indira Gandhi International Airport. This was my first visit to this zone and it was an eye opener. I travelled through Palam Vihar on the Carterpuri Road towards a village named Chauma. These roads through various rough patches lead you to Dwarka or Airport or Najafgarh in Delhi. To be frank I don’t know whether even such rough patch exist, I just looked these up on the maps. The current road that links several upcoming sectors is supposed to be a secondary access till the Dwarka Expressway is up and running. Here is a word of caution before you read further – “the photographs here are just an illustration we are not passing any judgement on any project or development in the region”. A railway crossing, filth and pigs, potholed village roads and lot of muck welcomed us to the secondary access road also called Bajghera Road. I will let the pictures talk to you than naming any realty firm or the projects. All I wish to point out is that the dirty and unkempt access road through which a large village and several upcoming projects are being served is in shambles. I went on a day when it rained more than the appetite Gurgaon has to drain out water. It is not about whos who of realty industry announced a project in this region but its more about why the consumers fell for the pricing, the properties at Dwarka Expressway were commanding between 2010-14, 2015 anyways has been the year when reality caught up with real estate sector in Gurgaon. 1.Proximity to South Delhi –South Delhi like South Bombay is a prime destination of the capital city of India. Come what may South Delhi is unlikely to witness power or water cuts, it has the most beautiful roads, parks and other forms of infrastructure or amusement schemes. 2. Prevailing property rates at Dwarka –I quickly checked pricing of some projects in Sector 22 of Dwarka in the years preceding 2014. Simultaneously I looked at pricing of some projects in Sector 111-113 of Gurgaon (Dwarka Expressway). It looks evident that there was a direct correlation of pricing in two markets. While Dwarka has a Delhi address which is a big draw for anyone to own a property in Delhi, Gurgaon was offering properties with newer and world class amenities at similar prices. Probably this drove lot of people to buy in Gurgaon rather than in Dwarka. 3.Gurgaon’s Masterplan –If one looks at the Dwarka Expressway Masterplan and planned settlements, these look very well thought of. Unlike the rest of Gurgaon which came up in an haphazard manner with not much attention given to building quality infrastructure, on the other hand Dwarka Expressway will have a wide road, BRT and Metro Rail connectivity. There was a lot of thought given to density of housing in the region as well as commercial developments. All these and in general the love for owning a property in India drew end users and investors to this region. As my colleague put it rightly “Investors have bought at a rate of INR 10,000 per sq ft in some of these projects, I don’t foresee them making much returns on their capital” (this statement is highly moderated as we don’t want to be perceived as bears in real estate). Just to reiterate -PropStory we will never take sides or make projections, we simply love to look at current facts and try to smell an opportunity if there is one. While we were driving down and clicking photographs through our car windows which were wide open, we passed by a dumping ground, the stink was so bad that even when we rolled up our window there was no respite from the foul smell. We turned back and checked our Google maps for more projects that we were aware of. However we were unsuccessful in finding our way through the maze of kutcha village roads. At one point we could see several multistoreys coming up at a distance and we thought of clicking the current villages in foreground of the supposedly new age houses coming up in the background. After this we turned back and decided to go to our homes in other areas of Gurgaon. We were tired, but more than that we were aghast at the state of current approach to this region. While no part of Dwarka Expressway is contiguous beyond a few kilometres this one is particularly disappointing, partly because of land acquisition issues which now seem to have been sorted. We were also amazed at the risk taking ability of investors and builders to have priced their products on HOPES of connectivity to Delhi. The connectivity will definitely happen, when is the question? And more pertinent is a question, what valuation justifies a property bet in this region of Gurgaon. Today is not the time that a project soft launch or its eventual launch will see a horde of people sending cheques to book their apartments even without visiting the site once, this trend seems to be a passé in Gurgaon….for that matter across India. Dwarka Expressway (1) – An Investment Hotspot? Or A Bet Ahead Of Time? When approaching expressway from the NH8 you need to cross the toll which is crowded at various times in the day. And in case you are resident on this side of the toll it means you paying up to cross the toll gate twice every day. I decided to save some money and drove on the Pataudi Road to reach the entrance to the expressway at Sector 37 D. The ride on Pataudi Road is not at all pleasurable as it is potholed and you need to go through a number of villages. Several farms still exist, though many sites seem to be mobilised now. This is a sea change in two years that I witnessed. The Railways over Bridge which was in dispute for sometime is also seeing development activity. However there are vast tracts of lands where only a board is placed and it reads “ABC Project by XYZ Builder, Now Is The Time Or Never”. Such hype and hysteria created an impression that real estate will run out of bounds of middle income which it did but not just because of price rise. The market today is marred by poor delivery track record and government is no less responsible. Look at it the sewer and water lines are still being laid though many projects are in advanced stages. Actually it is common to hear from a builder that if the infrastructure work was complete he would have delivered the project, as no consumer will find the project habitable at this point. So isn’t Dwarka Expressway an investment hotspot – We have as a policy stayed away from making predictions. We feel the developments along this road are well planned unlike rest of Gurgaon today. However the disconnect in pricing during the years of frenzy led to great mismatch between what this area offers today and cost of home ownerships. Projects which are complete along this road or just off Dwarka Expressway see dismal occupancy, as currently there are no schools or hospitals to talk about. There are no shopping malls or offices here either. So one was being made to pay the top dollar to own an under construction apartment here with no social and economic infrastructure in place. We believe the discounting of future was done at lower rates not commensurate with the high risks to this market. Finally look at how real estate is sold and marketed at Dwarka Expressway. Conceived in the year 2007 as part of the revised Masterplan of Gurgaon the 8-lane highway is supposed to be an alternate route to reach Delhi bypassing Gurgaon. The project was to be completed before 2010 Commonwealth Games however it remains in limbo. Disputes around land acquisition pushed back the construction of Dwarka Expressway which remains complete now in patches. We have seen recent improvements in connectivity, however no 2-3 km patch is without another diversion you encounter on this road. It is estimated that over 40,000 residential units are under construction along this road. The region was being marketed as an affordable option to the now costlier areas such as Golf Course Road and Sohna Road. More than the residential units the area is supposed to come up as a business and retail hub probably self sufficient in all regards. The prices were being benchmarked to Gurgaon areas in areas along the NH8 and to Dwarka in Delhi along the IGI T3 Airport. Our primary research tells us that plight of many projects in this region isnt great, even if a project is handed over it can’t be inhabited. Infrastructure activities such as water, sewage etc. are still coming up. The road development which commenced in 2011 is still underway. The real estate prices which rose sharply between 2009-13 have now stagnated. Newer launches are happening at lower prices or through finance schemes. With road development now picking up may be the infrastructure work will also gain pace. However, current supply in the market exceeds the demand and prices may not be in a hurry to rise in near future. The fate of Dwarka Expressway project and eventual hype around it is just an example of project delays that seem to have become norm across India. However, good infrastructure is a necessity.